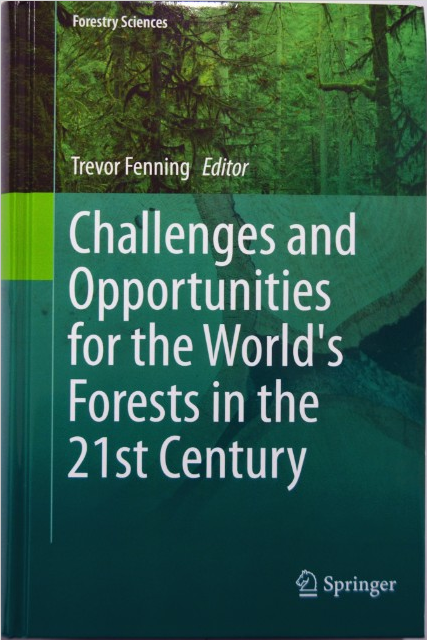 December 31, 2013, book "Challenges and Opportunities for the World’s Forests in the 21st Century", edited by Dr.Trevor Fenning, from Center for Forest Resource and Management, UK Forestry Commission, was officially published by Springer Dordrecht Heidelberg New York London, it was also available on line at the same time. This book addresses the challenges and opportunities faced by the world's forests posed by climate change, conservation objectives, and sustainable development needs including bioenergy, outlining the research and other efforts that are needed to understand these issues, along with the options and difficulties for dealing with them. It contains sections on sustainable forestry & conservation; forest resources worldwide; forests, forestry & climate change; the economics of forestry; tree breeding & commercial forestry; biotechnological approaches; genomic studies with forest trees; bio-energy, lignin & wood; and forest science, including ecological studies. This book consists of 36 chapters. The chapters are contributed by prominent organizations or individuals with an established record of achievement in these areas, and present their ideas on these topics with the aim of providing a ready source of information and guidance on these topics for politicians, policy makers and scientists for many years to come. Dr.LI Nuyun, Executive Deputy Director of Climate Change Office, the State Forestry Administration of People’s Republic of China, and Secretary-General of China Green Carbon Foundation, contributed to Chapter 6 titled “Sustainable Forest Management in China: Achievements in the Past and Challenges Ahead”. She describes the various approaches to forestry that have been utilized in the People Republic of China since it was founded in 1949, from the focus on production orientated forestry in the early years, to today’s efforts that are explicitly intended to develop fully sustainable forest and landscape management approaches, to offset its greenhouse gas emissions in accordance with international agreements. This hugely ambitious programme is being developed within a framework of policies drawn up at the highest levels of the Chinese government, which were very publically promoted by the former President Hu Jintao. Nevertheless, as with much of the rest of the world, the pressure on the land is increasing, so it remains to be seen how far China can succeed with these efforts from its domestic forest base alone, but with the scale of the resources that the country is dedicating to this objective, and in combination with other renewable energy approaches and environmental management efforts, much more progress will surely be made than would be the case otherwise. 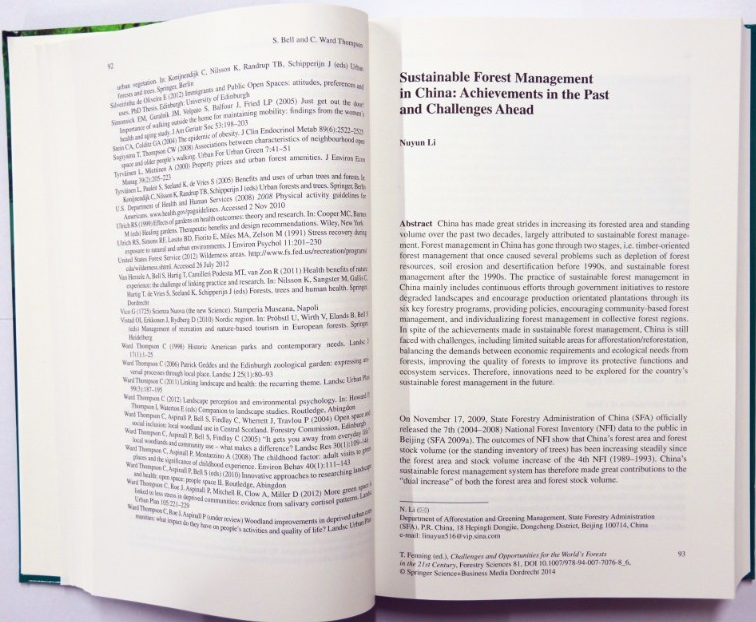 Through her chapter, readers also will know a new era of Chinese government to promote the sustainable development of forestry’s new mission, new expectations of the public for forestry, new initiatives for sustainable forestry development and the presence of new challenges in the forestry sector. If you are interested in Dr.Li’s chapter, you are welcome to contact the service mailbox of China Green Carbon Foundation at thjj@thjj.org to get the pdf version. However, you are responsible to keep it for personal use only according to the agreements between Springer and authors.